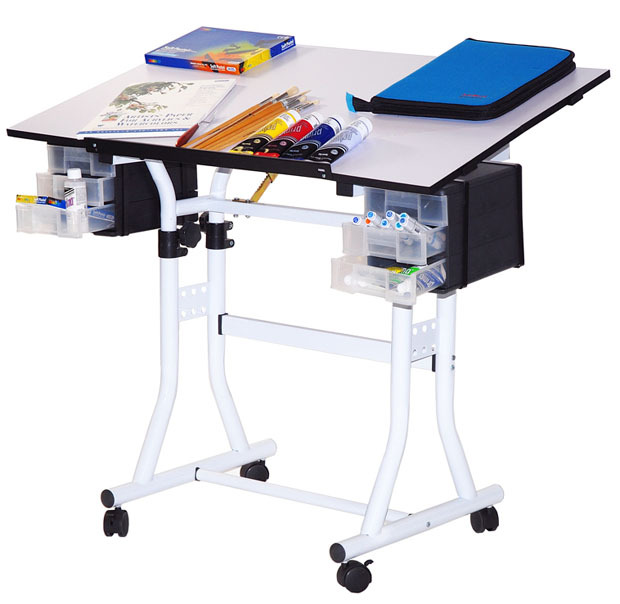 * The best utility table made for the crafter, hobbyist, architect or artist. * All at an affordable price, the Weber Creation Station combines height and tilt adjustment, strength, stability, and convenience for the one and only workstation designed to meet all the creative needs of beginners, professionals, adults and children. * Incredible features include: 24" x 40" top with square corners. * One-hand tilt-angle mechanism adjusts table top from 0° to 45°. * Height adjusts 31" to 34" in the horizontal position (basically desk to Drafting height). * Two sets of 3-drawer storage units, each 7" Width x 7.5" Height x 10" deep per 3 drawer module. * Set of 4 castors for easy moving, 2 are lockable for stable positioning. * Sturdy tubular steel construction, 1½" dia. with powder-coated finish. * Art materials/supplies shown not included. 44" x 27" x 6"